Ben Thomas addresses the BeefEx 2016 conference on the Gold Coast. How big a deal is Australian beef production on the world stage? Compared to total world protein supply, Australian grassfed and grainfed beef production accounts for less than half of one percent, as the above image graphically illustrates. “Needless to say we are a very, very, very small piece of the puzzle,” MLA chief economist Ben Thomas told last week’s BeefEx feedlot industry conference at the Gold Coast. So we are pretty small global players. What does that mean for our future? Mr Thomas’ message was that Australia should capitalise on its grain feeding systems to reduce the variability of supply and maximise production. In the US, where the vast majority of cattle are lot fed, cattle produce about 600 pounds of beef per head on average. That is roughly double Australia. Here, where grassfed systems dominate (at any given time the proportion of cattle slaughtered in Australia that are grainfed is between 35-39pc), beef production equates to about 300 pounds per head. Because Australia is such a small piece of the puzzle, were we to ramp up grain feeding to a level where our beef production per head matched the US, our beef production under that scenario would still only account for 0.9pc of world protein production. “So we are not going to flood the market,” Mr Thomas said. The wild swings that can occur in Australian cattle supply have been well documented through the recent drought years. Australian weekly cattle slaughter shot up to 160,000 in 2014 before dipping below 120,000 head this year. It may take until 2020 for weekly kill rates to return to what we could consider normal levels. Australia’s national herd has struggled to get over 28 million head, largely because of the limitations of grass and stockwater. Having a greater proportion of cattle on feed, Mr Thomas told Beefex, would go a long way toward reducing huge fluctuations in supply, and in turn prices. Feeder cattle prices in Australia have risen by 140 percent since 2014. In the same period, the finished article – represented by the 100-day grainfed over-the-hook indicator – has risen by only 50pc. This disconnect appears set to continue with feeder cattle prices likely to remain high for at least another six months, as the nation goes through a herd rebuild in the wake of recent widespread rain. At the same time the finished article will continue to be pressured by growing global production from Brazil and the US. While feeder cattle prices are set to remain high, grain prices are expected to remain fairly low for the next decade, according to OECD forecasts, which should help to encourage more cattle into feedlots. “Stable and consistent supply is where the feedlot industry can come into its own and build production and capitalise on demand,” Mr Thomas said. “To seriously build that herd again, being able to leverage grain to finish more cattle would go a long way toward alleviating some of that pressure. If only 1% of Brazil’s production is high quality and most of Australias is of high quality then an increase in quality product from Brazil by a relatively small percentage would see great pressure on our industry. We are high cost, slim margin operators at all levels of the industry and the mantra our industry organisations continues to be focussed on, involve increasing costs for the production of our product. Brazil is a much lower cost base operator and for moderate investment can lift it’s product quality significantly and still undercut us by a worthwhile margin. With respect to Mr McCamley, There are only so many Mercedes customers and dealerships about and Hyundai wouldn’t have grown the way it has in this country if there was no demand for lower cost Asian cars. At the end of the sales year I think Hyundai and its like minded car producers have more in the bank than the Mercedes dealers. Mercedes has moved production to South Africa and South America in it’s quest to be competitive and our own vehicle industry which is/was high cost,low volume by world standards is about to be put down for good. There is a lesson for our industry in that. Producing a high cost, good quality vehicle didn’t save them and it is foolish to think that the same forces won’t apply to red meat in our country. The idea that the Asian middle class will want to pay more for our product over the long term is a wishful one when viewed in the light of the recent Indonesian feedlot industry’s experience and it wasn’t high quality product that upset that little applecart. If Brazil can improve it’s quality then it will become a big player, quickly: and it seems that China is welcoming them with open arms and investing in that improvement to a significant degree. More than ten years ago MLA was at BeefEx pushing Australian feedlotters to expand and build more feedlots. MLA believed demand was on the rise and Australia should expand feedloting capacity to two million head of pen space. I argued publicly against MLA using our levy dollars to push for increasing supply before demand arrived. The expected demand (at a price we could all make a living from) never materialised. Thankfully feedlotters didn’t take MLA’s advice. Fast forward to today and it appears we are back on the slippery slope. According to this article MLA via Mr Thomas says that Australia should ‘capitalise on its grain feeding systems to reduce the variability of supply and maximise production’. He argues that a 10-20% increase in production won’t affect price because we only produce less than 0.5% of global protein production. I suggest that comparing Australian beef to globally mass produced protein such as chicken, pork and farmed fish is simply not relevant. Australian beef is produced under stringent and expensive animal welfare, food safety and eating quality systems that enable us to offer the world a diverse range of high quality product. For example, our hygiene standards for processing are set at a level that enables us to offer the world’s longest product shelf life. Mercedes Benz doesn’t consider low priced Asian cars to be its competitor. Mercedes Benz focuses only on other manufactures of high quality cars, such as BMW and Audi, when it is developing marketing and production policy. 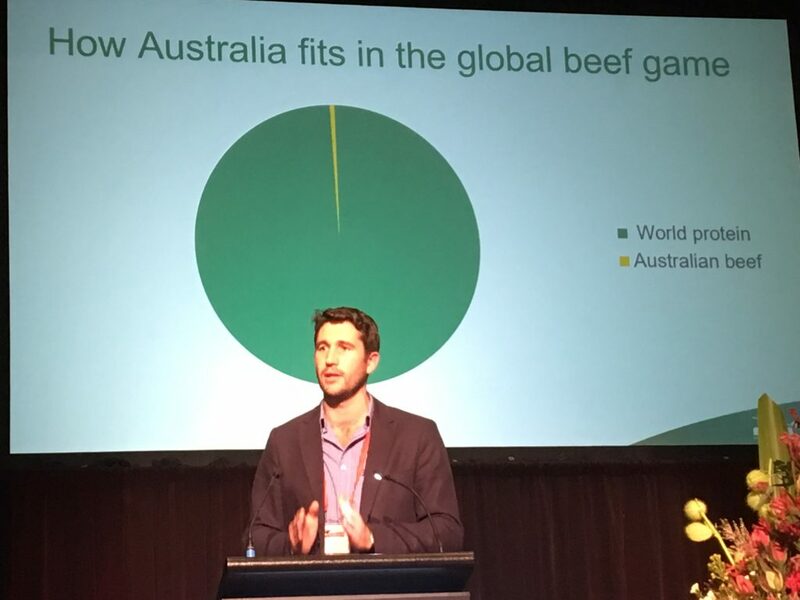 When the protein pie chart is redrawn to only include relevant competitors, the Australian beef share is a much larger slice. The best way for any business to maximise both production and price received, is to never quite meet demand. If supply meets demand a tipping point is reached and price drops quickly. MLA must stick to its core business which is to increase demand for our product through prudent expenditure of our levy. If successful, prices will rise and as always producers will follow with increased production. Despite all the hype around global markets, Aussie dollar and political subsidies , in Australia , our market is irrevocably controlled by the weather. Drought , influx of cattle, many not ideal to process, low prices. Widespread rain, shortage , high prices, until the fat cattle hit the market, and the job is oversupplied again.Volatility is the norm. Knowing the cost of replacement of a saleable article and timing the marketing of that product will ensure you get the best of what is being offered. Don’t complain about the rules, play the game. Grant, one would wonder what the answer to your question would be, the model he is proposing has done little to reduce volatility in the US market in recent years. Apparently a Brazilian presenter at the same conference stated that currently 1% of Brazil’s product would be considered high quality. I would ask Ben Thomas what percentage of Australia’s production would be considered high quality, our product is well regarded globally for many reasons, let’s hope competing at a price point with Brazil is not one of them! I would also suggest the ‘cost plus a margin’ business model has done little to reduce the historical price volatility for one sector of this industry, it would be interesting to see the reaction if this presentation is repeated at the upcoming MLA AGM! So ‘the fundamentals ar good’, so why does the price collapse FOR THE FARMER? As a farmer that pays MLA the $5 levy, for research, market iunformation etc. I want to know why the price TO THE FARMER collapses whenever local production increases, if world demand is so stable?